How I decided not to be locked out of my HANA anymore! Last year during all SAP InnoJam, many teams managed to get locked out of own SAP HANA systems hosted on the SAP Cloud Platform. With the SAP Cloud Platform developer edition, you can create your SAP HANA MDC (Multi Database Container) tenant, and you even get access to the “holy” SYSTEM user. But “with great power comes great responsibility” as Spider man once said! Therefore, you can brilliantly run a demo of your last 36h of hard work, or simply have nothing to show 5 minutes before your presentation. I’d rather have everyone on the bright side, as unfortunately there is nothing much you could do to get back your access. But this requires an “ssh” access to the physical machine, and unfortunately (or may be fortunately), only the SAP Cloud Platform Team operation team have that access. We all faced that annoying but necessary pain named the “password policy” which forces you to update your password every now and then, or to include at least one special character. The cool thing now that you own your HANA instance, is that you can do whatever you want (but at your own risk). You will find more details here for the Password Policy Configuration Options. Give your SYSTEM user twin brother! This is from my point of view a “must do” thing whenever you create a new database, especially if you work within the boundaries of the SAP Cloud Platform. 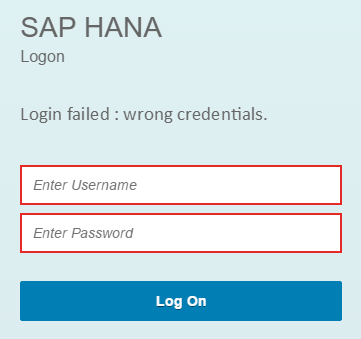 If you want to know the reason, it simple: everyone knows that you have a “SYSTEM” user in your SAP HANA instance, and this one is visible in the cloud, so anyone who knows your account identifier and your instance id could potentially try to access your instance. Also, and unfortunately, many people will use “trial”, “hana” or “mdc” as their instance id (and I know as a tutorial author I’m somehow guilty of that as I recommend to use the name I provide in my content to ease the progression). With an on-premise version like with SAP HANA, express edition, your firewall will protect you from external access. But still, if you have clumsy fingers like me, you may hit that problem, and having a backup user with “privileges” is not a bad idea. But for step 3 (“Create your user”), you will run the following SQL instead. When a user is locked, the “User Lock Time” (password_lock_time) is by default 1440 minutes (1 day). But now you know what to do if you want to change that. There is also a specific parameter to exclude the SYSTEM user from being locked (password_lock_for_system_user) if you want, but this means that you leave the door open for brute-force connection attack on the user from my point of view. Off course, you should personalize the username (SYSTEM_BACKUP) and the password (Welcome17). Now, you should not get locked out of your own database anymore! Very useful !. Funny how much time it takes of your daily day to solve these silly password issues. I suppose what’s most startling is that we’re all working in the line of business of automation, yet fail to automate silly stuff like this at the 2nd occurrence. I think you always for the 3rd occurrence, and realize that it was painful at the first and second one, to then decide to invest some time to prevent the issue to happen again..